NAFSE's first three-day capstone workshop was held at Stockton University in Galloway, NJ November 4-6th, 2015. Dr. George Zimmerman, Professor of Environmental Studies at Stockton University, graciously hosted us and Amanda Mahaffey of the NAFSE leadership team and the Forest Stewards Guild, organized the event. November 4th dawned with 50 attendees munching on muffins, ready for a gorgeous day in the field. We hopped in several large vans to observe different field sites on public and private land (see map below). Our first stop was on the Haines family's Pine Island cranberry farm property where we learned that these high value crops needed exceptionally clean water. The Haines family has long understood the importance of caring for the forest around their farms for water quality, but they also need to regularly reduce fuels in case of large wildfires near their fields. Brian Kieffer, of Pine Creek Forestry, LLC, (owned by Bob Williams who could not attend as he was receiving an award for communications from the Society of American Foresters), explained the history of the 15 acre site nestled between the cranberries and the road. The site had undergone selective silvicultural thinning, with a 50% reduction in basal area and slash left behind, and had also undergone prescribed burning approximately 4-5 yrs ago. Pine Creek Forestry bases their silvicultural treatments on the Stoddard-Neel approach which aims to increase species diversity, provide habitat, and promote uneven-age stands using selective logging and prescribed fire. The group piled back in the shuttle buses and we all headed to our second stop, also a site treated by Pine Creek Forestry. This site had 30-40% of the basal area removed and chipped on site, was burned 3-4 years ago, and was ready to burn again. There was a cluster of shortleaf pine and the group had a discussion about the historical amount of shortleaf pine in the Pinelands and it's timber value. The site was home to silvery aster and pine barrens gentian. We talked about the southern pine beetle and the main strategy for combating infestations, which is thinning. Next John Parke, of New Jersey Audubon, told us the story of the cooperative effort between the Haines family, the University of Delaware, and Tall Timbers research station to reintroduce Bobwhite quail to the Pinelands of NJ. They found excellent potential open habitat with rare early successional forage plants and no invasive species on areas that had been under forest management by the Haines family. Some family members remembered seeing bobwhite quail as young children and with the help of NJ Audubon, the partners reached out to the Tall Timbers research station which has a long history of quail conservation in Florida. They found suitable locations in which to release bobwhite quail back into New Jersey on the Haines property and had 14 nests in the first year of release with 66 hatchlings which was deemed a tremendous success. Our third stop was a bit too much for our shuttle bus drivers involving some sketchy sugar sand patches on the road. Participants were game for walking or riding on NJ Forest Fire Service trucks the last half mile or so to get to our site. (The following photos by Inga La Puma of NAFSE and Wendy Fulks of Fire Adapted Communities). As we arrived at the Speedwell site, there was a general murmer of ‘ahhh’ ‘ohhh’ and lots of interest as to what was going on at this crossroads. Tom Gerber of the NJ forest fire service (NJFFS) explained that we were looking at Wharton State Forest on one corner, the New Jersey Conservation Foundation’s Parker preserve on the other and the Lee Brothers Cranberry Farm forested tract across the way. These three patches of land were different in structure, species and density. The Wharton side, Tom explained, had been under a prescribed burning regime rotation every 6-10 years which was evident in the sparse understory of ericaceous shrubs and pitch pine over-story. 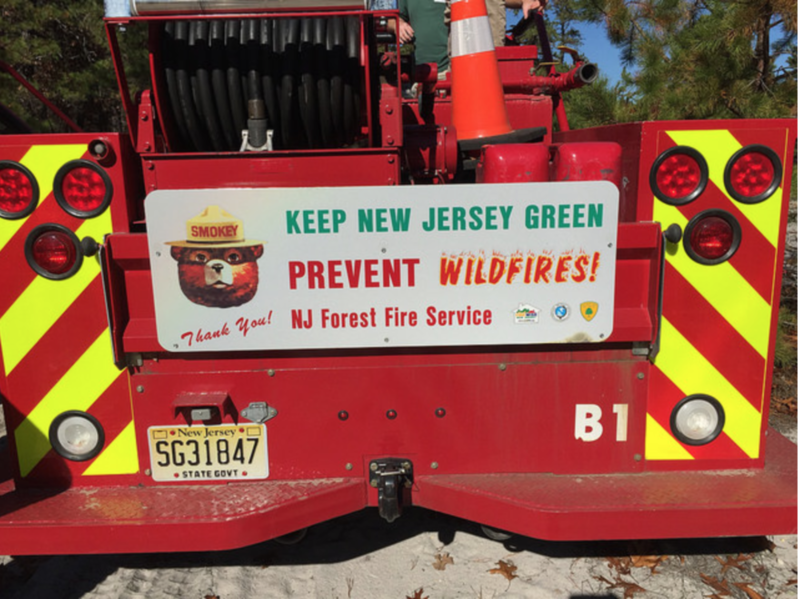 Tom noted that the NJFFS began their prescribed burning program in 1954, was the first in the US, and has a long history of burning for risk reduction for NJ residents. The goal for the NJFFS is to burn 20-25,000 acres a year on state lands to reduce hazardous fuels. The Parker Preserve is an area of old cranberry farms and forests that is gradually changing due to succession. The area we were viewing hadn’t burned since approximately 1998-99 and significant undergrowth and ladder fuels were evident. It was evident that unburned areas provided very different kinds of habitat, but also contained an abundance of risk in the event of a wildfire. Steve Lee, one of the Lee brothers that owns the adjacent tract, explained that his patch of land was harvested in 2001 with a variety of methods including drum chopping, then Arsenal™ was applied to scrub oaks and the area was planted with a pitch pine-loblolly hybrid. Natural regeneration in the understory was evident, as were a few of the larger trees left after harvest. Steve noted that his purpose in managing this forest was to protect his watershed as well as create a new revenue source in the form of timber for his family. He also explained that they plan to try prescribed burns to help prevent further regeneration in the understory. Next up was our fourth stop for lunch at Coyle Field, where State Firewarden, Bill Edwards gave us a warm welcome and invited us to check out the equipment that the Forest Fire Service uses to fight wildland fires in New Jersey. We heard from the aviation folks about the ping pong devices they use, saw the amazing array of aircraft at the field, inspected the specialized brush trucks used in firefighting in the Pinelands and saw a flame-thrower on the back of an ATV! For our fifth stop we headed over to the Cedar Bridge Fire Tower where Dr. Ken Clark of the USDA Forest Service described the breadth of his research on carbon dynamics and the energy balance of prescribed fires. He showed us an area that had last been prescribe burned in 2013. Then he started explaining all of the data that he and his colleagues derived from these types of burns near their carbon flux towers. They described a great amount of turbulence and heat released from fires and monitored the amount of heat required to release the water vapor from the fuels. He described white smoke as containing mostly water vapor and black smoke as mostly particulate matter. With restrictions on carbon from the EPA, the concern is that the EPA will begin to monitor forest management via carbon accounting. His work has shown that carbon exchange is back to previous levels three years after a burn and that 5-8 year old stands will be sequestering carbon above and beyond what the forest was sequestering pre-burn. 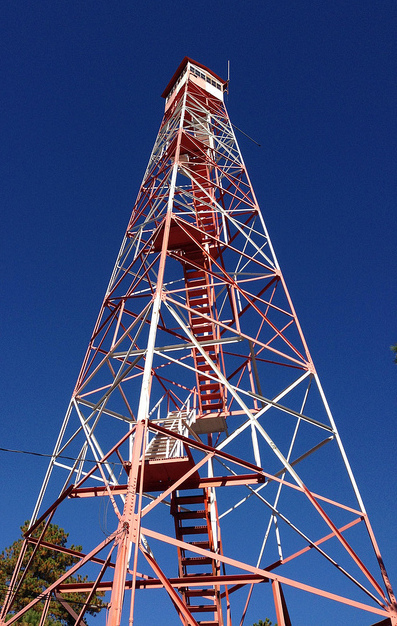 We also got to take a quick run up to the top of the fire tower and check out the view of the flux tower just above the canopy! On the third day of our workshop (the second day was filled with presentations which I will be posting on another blog post), we walked straight out from the Campus Center to see the project being undertaken by Dr. George Zimmerman and Pine Creek Forestry on the Stockton University campus. This project is aimed at reducing fuels for limiting the risk of southern pine beetle infestations as well as wildfires. Dr. Zimmerman described how the project to manage the forest was accompanied by monitoring experiments involving numerous scientific disciplines and students. There are three meteorological stations, one in an uncut patch, one in a field, and one in a cut patch. The thinning was to reduce the pheromone aggregation of the southern pine beetle. There are different levels of thinning to understand how these methods affect the forest regeneration and mammals. The wildlife class is conducting mammal trapping to understand the uses of these different forest densities by various mammals. Next we went with John Sanford of the NJFFS to a site where he assisted Dr. Zimmerman in conducting prescribed burns on the Stockton University Campus. The fire event was described as highly engaging to students and as successful in reducing understory. They have more plans to expand the Stockton University forest management project by using deer exclosures to estimate the impact of deer browsing on native regeneration as well as different methods of tree removal and studying the effects on hydrology in the area. Finally, we took a quick side-trip to see the Atlantic White Cedar swamp on Stockton’s campus. Gorgeous! Overall, the field trips before and after our ‘inside day’ were extremely informative and exciting and all of the NAFSE team leaders would like to thank the field trip organizers for all of the hard work and effort that went into hosting each site.